Wheeeee! You're riding a flying unicorn down a magic rainbow while kittens and cupcakes rain from the sky. It's all so real. Then, suddenly, everything goes black as you mindlessly take the final step in your living room to pull the cable from your virtual reality headset. There's a virtual elephant in the living room, and here it is: High-quality virtual reality is going to be literally held back by the need to tether to a console. Last week's Electronic Entertainment Expo (E3) in Los Angeles offered new ideas (and old) to solve the catastrophic VR tethering problem. The world of VR has been teasing fans for decades. In recent years, the busting out of real VR has always been a year or two away, they told us. Finally, I'm happy to announce that VR is really here this year. 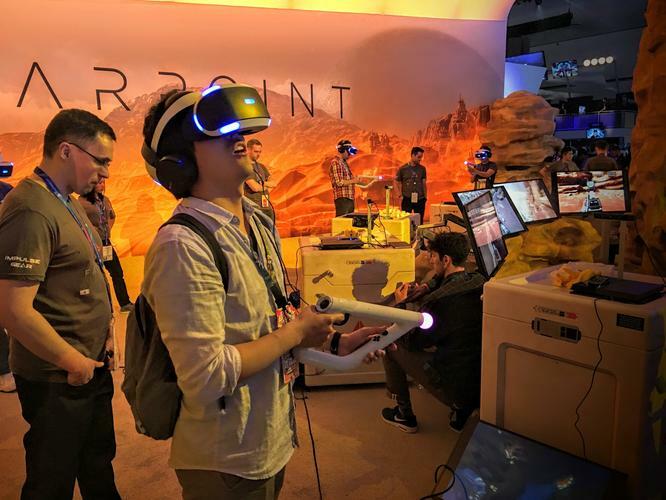 In fact, many E3 attendees told me the show represents a turning point for VR -- that this is the event that makes it real at long last (rather than virtually real, I guess). After years of prototypes, teasers and promises, we're finally getting something solid. The Sony PlayStation VR got a price ($399), a release date (Oct. 13) and a promise of 50 games by the end of the year, just in time for the holidays. Nice! Deloitte says virtual reality spending will pass $1 billion this year. So VR is also getting real as a business. By the end of this year, the VR space will be a real market with real content and real products. Too bad the VR you really want won't arrive this year. High-end VR, which provides the most believable virtual experiences, is tethered to a console, which itself is plugged into a wall outlet. The cabling is necessary because the technology needed to provide these amazingly life-like virtual worlds is still too big to go mobile. Arcades and special theme parks will use products like the Void Rapture or Starbreeze StarVR, which run on large, powerful computer systems and require serious cables connected to the headsets. At home, Facebook's Oculus Rift, the HTC Vive and Sony's Playstation VR are going to be awesome. But they'll require you to be very careful about how you physically move while you're lost in VR land. Remaining aware of your actual physical surroundings while using VR is harder than it sounds. The whole point of VR is total mental immersion in a space that isn't really there. People do completely forget about their actual surroundings. This fact was accidentally demonstrated by all the VR demos at E3. Every attendee trying VR was either strapped into a chair or attended by a company representative, who stood there to make sure there weren't any mishaps. Various products and features are starting to emerge to deal with this problem. A company called Nyko showed at E3 a $99.99 product called the VR Guardian, which is a wristband alert system for making sure you don't walk into a wall or trip over a coffee table while immersed in VR. Four Bluetooth sensors are placed at the edge of a safe VR space, say, in your living room. Two wristbands -- one for each wrist -- vibrate when you get too close to the edge. The VR Guardian ships this year. So high-end VR is spectacular, but it comes with the risks and hassles of physical tethers. Lower-end VR, which uses your smartphone as the computer, screen and sound system for VR, solves the tether problem. The E3 star in this category was the Zeiss VR One Plus, joining a category that includes the Samsung Gear VR (Amazon price - What's this?) and the Google Cardboard platform. Like Cardboard, the Zeiss VR One works with any phone with a screen at least 4.7 inches in size but no more than 5.5 inches and can play Google Cardboard-compatible content. While smartphone-based VR systems are tetherless, they're also low-quality. None of these systems are acceptable for anyone who wants true believability as well as a high quality experience in VR. The high end of the market is too high to abandon tethers. The low end of the market is too low to offer a quality experience. That's why a new class of VR (between the high-quality tethered systems and the low-quality tetherless) is so promising. The new category of VR might be juuust right! Alienware, a gaming hardware company owned by Dell, demonstrated at E3 a VR backpack. The idea is to enable the kind of powerful VR experience you'd get tethered to a big console, but without the tether. Alienware makes a Windows-based gaming console called the Alienware Alpha R2. The VR backpack is essentially an Alpha R2 and a big battery integrated into a backpack. A regular console Alpha R2 with a graphics upgrade that enables high-end games will cost upwards of $600, so Alienware's VR backpack could be very expensive. The Alienware concept joins other backpack VR prototypes previously shown or announced from HP, MSI, Gigabyte and Zotac. All these concepts involve jamming VR PCs into backpacks with a battery. Expect real, hands-on demos and additional announcements related to backpack VR systems at CES in January, followed by expensive products next year and affordable products the year after. Backpack VR isn't perfect. While the backpack idea frees you from the dangers of tethers, it also saddles you with a heavy backpack. Alienware didn't specify the weight of its device, but VR backpacks tend to weigh between eight and 10 pounds. Another class of VR hit E3 in the form of a truly mobile VR console. Immerex showed off their VRG-9020 product, an integrated VR headset and battery-powered console. The console part looks like an old-school CD player from the 1990s. The company promises a VR experience that's better than the smartphone-based ones. The Immerex VRG-9020 comes with a controller, but users can also deploy their smartphone as a controller. Interestingly, the headset fits like glasses, rather than a strap. The goggles are relatively small and light. Immerex says their VRG-9020 will offer a higher-quality VR experience than the smartphone-based devices. While the Immerex VRG-9020 doesn't look all that promising, the company is devoted to remaining proprietary, making the whole system and all the games themselves. The general category of truly mobile VR that's better than smartphone-based VR will probably be a winner over the next few years. The good news is that after years of waiting, virtual reality is finally real. By the holidays, you'll be able to walk into a local store at the mall and buy high-end VR systems and games to play on them. You'll also be able to buy low-end, smartphone-based VR headsets and have real choice in that category. The bad news is that the VR experience you really want, which is high quality but mobile, is still a year or two away at the earliest. At least we'll have our PlayStation VR consoles to literally fall back on.